Our Motto: "Git Thar First With The Most"
And his dust is our ashes of glory." The General Nathan Bedford Forrest Historical Society is actively recruiting new members for our organization. "The PURPOSE of the Society is to honor and preserve the name and heroic deeds of General N.B. Forrest and his Cavalry. 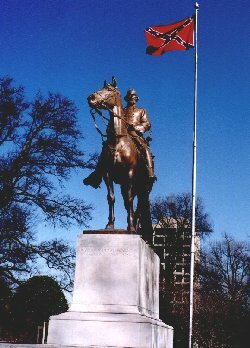 To Protect and Preserve the General's equestrian statue and last resting place. To be a research center for the study of General Forrest and his campaigns. To publish articles, manuscripts, photos, and books on the General, and to make such available to our members and the public. To host special events, historical tours and sponsor a speakers bureau of qualified Forrest historians. Also, to manage and maintain the Forrest related hiking trails in Tennessee & Mississippi." Members will receive special member's discounts, a membership certificate and a quarterly newsletter containing historical articles and preservation news reqarding one of the greatest Cavalry leaders in history! Annual dues are $30.00 and should be mailed to our headquarters listed above.